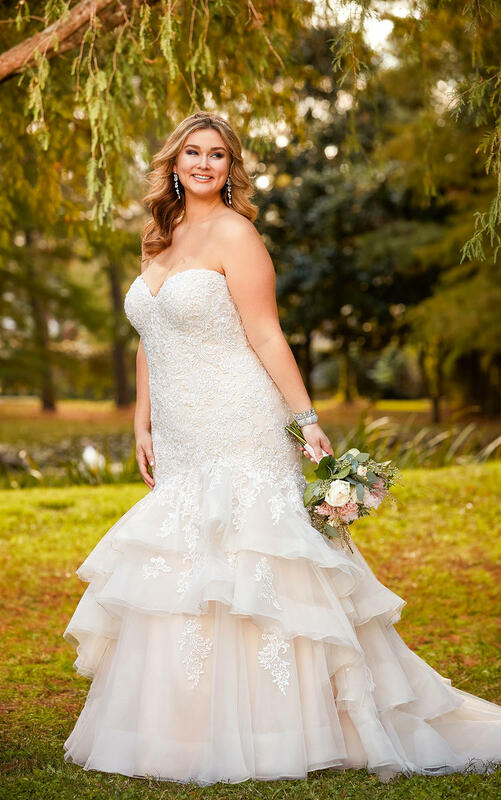 From Stella York, this dramatic lace fit-and-flare plus size wedding dress is an absolute show stopper! Lace and tulle over Regency organza has volume and texture like you haven't seen before. A tiered lace over tulle skirt creates a soft texture that plays off of the lace bodice. The asymmetrical layers have a wave effect that adds to the drama. The pattern of the lace elongated your silhouette and creates shapes that flatter and highlight your curves. With the option for a lace-up back or easy close zipper under Stella crystal buttons.